The patient’s first question was, “How did I get this?”—but there was no answer. The causes of lymphomas are unknown, he was told by medical professionals. This was the start of a bitter eight-year battle against the disease—a battle that the patient lost in December 2002. He was 46 when he died. His name was Sam Orbaum, and he was my ex-husband. Sam’s physician throughout those grueling years was Dr. Ora Paltiel, a Canadian-born Hadassah-Hebrew University hematologist. He knew her as a capable and caring doctor whom he fully trusted. But she was also an epidemiologist and a researcher who, like her patient, wanted to know why he had fallen victim to lymphoma—why, in fact, non-Hodgkin lymphoma (NHL) was targeting three times as many people in Israel and around the world as it had a half-century earlier. 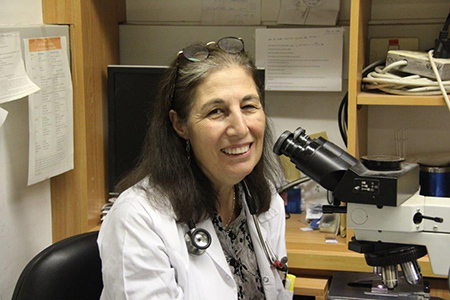 Today, Dr. Paltiel is dean of the Hadassah-Hebrew University Braun School of Public Health and Community Medicine, and she and her team are among those unearthing answers. Her study of NHL in 1,631 Israelis and Palestinians, conducted between 2010 and 2014, has not only pinned down a range of risk factors, it has also done much to substantiate what Dr. Paltiel refers to as the “Ora Hypothesis.” It is a hypothesis that offers a highly credible explanation for lymphoma’s soaring prevalence: that the use of antibiotics is resulting in children with imperfect immune systems surviving into adulthood, when they are susceptible to NHL. Israel, with its high rate of antibiotic use, is unhappily first in the world in per capita incidence of the illness. A cancer of the lymphatic system, lymphoma begins when an abnormal white blood cell (an abnormal B or T lymphocyte) forms and propagates, invading lymph glands and nodes under the arms and in the neck, chest, groin and/or abdomen. Dr. Paltiel is a self-described “lymphomaniac” who has always been involved in lymphoma research at some level. She came to Hadassah 25 years ago to help develop general clinical and, in particular, cancer epidemiology. The 2010 to 2014 study she led was, for her, “a dream project,” combining her expertise in both lymphoma and epidemiology. She designed it together with Dr. Dina Ben-Yehuda, then head of the Hadassah hematology department, adapting a model Dr. Paltiel helped build during a 2007 sabbatical at the Memorial Sloan Kettering Cancer Center in Manhattan. The study and its results were published in February 2017 in the celebrated peer-reviewed science journal PLOS ONE. B-cell NHL is the fifth most common malignancy among Israeli Jews and eighth most common among Palestinians, said Rania Abu Seir-Samman, Ph.D., a lecturer at Al Quds University in Jerusalem, who worked on the study with Dr. Paltiel as a doctoral student in Hadassah’s hematology department. Although Jews and Palestinians (the study included Israeli Arabs as well as Palestinians living under Palestinian Authority rule and beyond) live in the same general area, the two populations are genetically diverse, with different lifestyles, health behaviors and, often, medical systems. The work of Dr. Paltiel and her colleagues sheds light on the influence of both genetics and environment on NHL, noted Dr. Ben-Yehuda, who was recently named dean of the Hadassah-Hebrew University Faculty of Medicine, the first woman to head the medical school. The study confirmed as clear risk factors the use of black hair dye, four to nine hours of sun exposure a week, a first-degree relative with blood cancer, hepatitis infection and a history of hospitalization for infection. Specific to some forms of lymphoma were heavy indoor pesticide use and smoking tobacco. Because risk factors operate differently in different ethnic groups, interaction between environmental and genetic triggers seems likely. Investigation is still underway into whether different types of environmental exposure affect patients of varying genetic backgrounds differently—or whether this is linked with diet, environmental and housing conditions, socioeconomic background, cultural practice, medical services, early exposure to infection and more. She put the pieces together: “Through human history, a major cause of death has been infection during the first year of life. Babies once died in large numbers from infectious illnesses such as bronchitis, pneumonia and diarrhea. Antibiotics put an end to that in the developed world, and most infants now survive early infectious illnesses. The next step was to test her theory. “One way was to find out how many NHL patients were hospitalized for infection during their first year of life,” she said. “That would indicate an inefficient immune system unable to control infection.” That data existed in the Jerusalem Perinatal Study, a multiyear cohort of 92,408 babies born to Jews and Arabs in West Jerusalem between 1964 and 1976 who were followed into adulthood. “We ran the numbers and found that incidence of NHL was three times greater among those who had been hospitalized for infection during their first year of life,” said Dr. Paltiel. Evidence, both scientific and anecdotal, continued to come in. A colleague checked a Swedish hospital registry, begun in 1965, which showed a similar association: incidence of aggressive B-cell lymphoma was almost three times greater in patients who had been hospitalized for childhood infections. Then, a lymphoma patient with a pronounced limp consulted Dr. Paltiel. The limp resulted from paralytic polio contracted when she was 1 year old. In an epidemic in the Vienna displaced persons camp where she was born, she related, she had been the sole infant to suffer paralysis. This suggested that her immune system was deficient. If Dr. Paltiel’s theory is correct and NHL rates have increased because antibiotic therapy results in the survival of more individuals with flawed immune systems, the percentage of NHL victims should level out over time since the percentage of antibiotic use has also stabilized. And this, according to the Israel Cancer Association, is happening. The association’s 2015 World Cancer Day report noted that over the past decade, stability in NHL incidence rates was observed among Jewish men and Palestinian women, “as has a moderate downward trend among Jewish women and Palestinian men.” Dr. Paltiel does not, as yet, have an explanation for the difference between the cohorts. The study was also the first of its kind to examine whether hepatitis B is a risk factor for lymphoma. “Hepatitis C is a known NHL risk factor,” said Dr. Paltiel. “We wanted to know whether this was true for hepatitis B, too.” The findings were astonishing. While hepatitis B infection was not a risk factor for the 90-plus percent of adults who fully recover from the virus, the remainder—the chronic carriers—were five times more likely to have a family history of lymphoma and twice as likely to have the disease themselves. Here was yet more evidence that a defective immune system (one unable to clear the virus completely) increases risk of NHL. Following decades of research, there are now some answers for NHL patients who ask, “How did I get this?” Investigators hope that as more emerge, they will close in on this stubborn and often fatal blood cancer, and will find the therapies to destroy it. Wendy Elliman is a British-born science writer who has lived in Israel for more than four decades. Please include antioxidants in your diet. OPC-3 , foods rich in flavanoids and an old fashion bone broth will go a long way . My husband, age 70, has just been Dx with NHL. His genetic DNA came back that he is 2% Jewish; Other is Irish-Italian. The only childhood disease was a case of Juantice at Age 8. Healthy; no other factors. Besides not knowing cause, would you recommend he have any immune tests done, and if so, which ones?